The Coyote Valley Band of Pomo Indians and environmental groups marched in front of the Army Corps of Engineers in San Francisco on Tuesday. 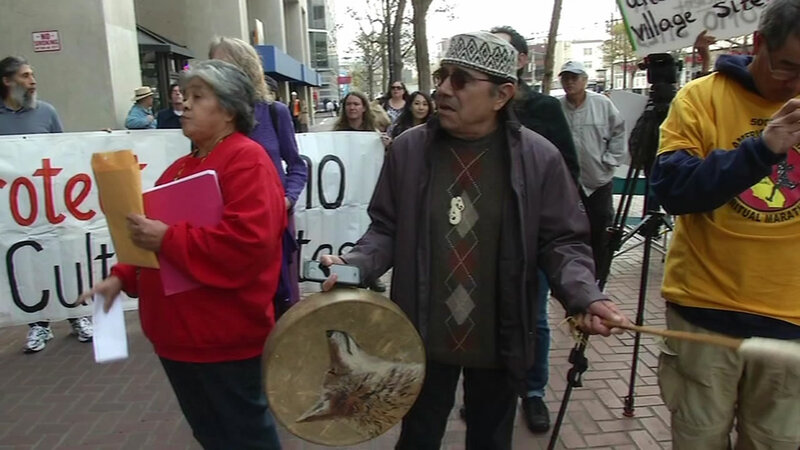 WILLITS, Calif. (KGO) -- In San Francisco, Native Americans are demanding the federal government intervene to save what they say are sacred sites at a controversial freeway project. Caltrans is building a bypass on Highway 101 around Willits in Mendocino County. The Coyote Valley Band of Pomo Indians and environmental groups marched in front of the Army Corps of Engineers on Tuesday. As we've reported, Caltrans already damaged one Indian archaeological site and found evidence of as many as 30 more potential sites in the bypass area. The tribe is demanding government-to-government talks with the Army Corps, which issued the permit. "We want to downsize the roadway because it's going to destroy cultural sites," Priscilla Hunter, a Coyote Valley representative, said. The Army Corps says it does not have authority to enter into consultations with the tribe. Caltrans is in talks with other Native Americans in the area, but there has been no agreement.